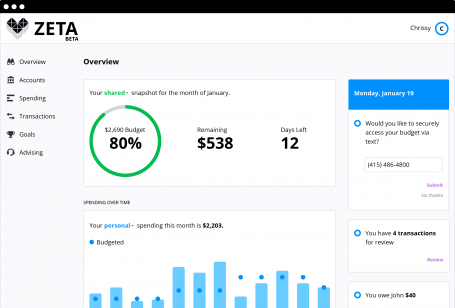 A personal finance tool designed for couples. 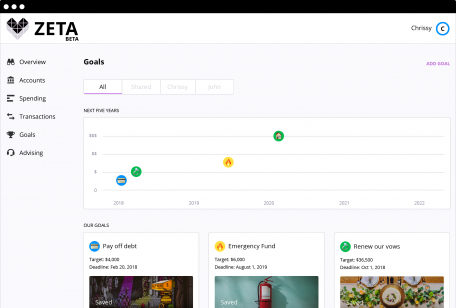 Zeta helps you stay on top of your finances together. One view of your shared finances. Track all of your accounts – whether they’re personal or shared. We support over 10,000+ US institutions to give you the fullest financial picture. Healthy finances start with knowing where your money is going. We’ll break down your finances across your individual & shared pools. Stay on the same page about your personal and shared goals. We’ll help you connect your monthly spending to the dreams you want to achieve. Communicate like a pro! 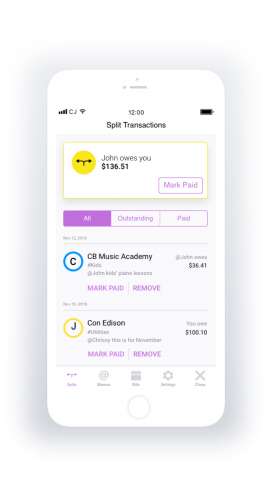 Tag your partner on specific transactions or split the purchase to keep a tally. You can even manage your bills together on Zeta. Money can be confusing, we make it easy. Take our 5-minute financial health quiz to see how you stack up as a couple (and get help if you need it). Moving in, recently engaged, or juggling three kids, we've got you covered. Getting serious? It's time to have the money talk with your SO. Check out our 20 Questions Money Game featured in Refinery29. Everyday couples describe the good, bad and ugly of mastering money together. Join Aditi & Dalmar for an honest, uncensored, and fun conversation about building wealth while juggling life, health and the pursuit of happiness. 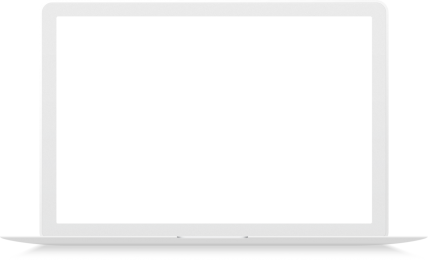 Resources to help you reach those money goals. Expert info, helpful tools, all made just for you. Zeta helps all kinds of couples - no matter what stage you’re at. 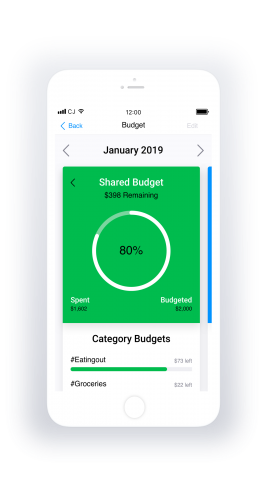 Manage your individual and shared monthly spending together. Figure out how to merge your finances together and build a financial plan. Set goals together and track the progress that you make towards them. I love your service...my wife and I are finally having real conversations about spending! My boyfriend and I have been using the website for a few months and find it so useful. Zeta does an absolutely excellent job at tracking and reconciling shared expenses as well as magically identifying our monthly bills. I'd been managing our expenses for a couple years and Zeta makes the process easy and transparent. I've had the best experience working with Zeta. Talking about finances has always made me feel overwhelmed. Zeta’s coaching sessions made a usually stressful process feel manageable. I’ve left each conversation feeling like I've made small wins and can keep growing financially in a way that is realistic, all with a little laughter & encouragement. account for joint expenses, but this is way better. 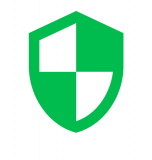 Zeta uses state-of-the-art, bank-level security practices to protect your data. You can read more about our security practices here. We implement strict authentication & data protocols so you're 100% in control. We don't store your financial logins or credentials. Our encrypted database ensures that your data stays your own.